Blogging Marathon: Week 2/ Day 3 Theme: Traditional Dishes Dish: Bedmi Poori Today's traditional dish is from the northern state of Uttar Pradesh. It is a poori stuffed with spiced urad dal paste. 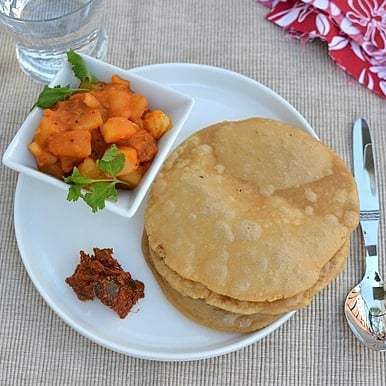 The end result is this slightly different pooris that are very filling and delicious.I followed the recipes from Valli's and Vaishali's posts. My pooris didn't fluff up like Vaishali's, but they tasted great anyway. For the filling: Soak urad dal for at least 30 minutes. Drain the water and grind to a coarse paste. Heat 1tsp oil in a nonstick pan and add hing, fennel seeds, cumin seeds and nigella seeds; once the seeds start to splutter, add the ground urad dal and mix well. Next add the chili powder, garam masala and salt. Cook stirring frequently until the mixture starts to leave the pan, about 6-8 minutes. Let the mixture cool slightly, then divide it into 8-10 equal size balls. For the dough: Mix atta, ghee and salt. Add enough water to make a stiff dough. Knead the dough until smooth and pliable. Cover and set aside for 15 mins. For Bedmi Pooris: Divide the dough into 8-10 equal lemon size balls. Flatten the dough into a disc, place the stuffing in the middle and cover it with the dough. Roll out into 4 - 5" discs. Heat oil for deep frying on medium-high heat. Fry the pooris until golden on both sides. Try pressing the poori while frying to puff it up. Removce with a slotted spoon onto a paper towel lines plate. Serve hot with potato curry.